I have an old Mac mini that I wanted to use to run a research experiment. Its whole purpose would be to run five versions of the same program millions of times over. I didn't need a monitor to watch such command-line action, instead I wanted to monitor the experiment remotely using the excellent program screen. Using a keyboard, monitor and mouse, I installed Fedora and the bits for the experiment, and confirmed it was all working. I then shut down the machine, removed the peripherals, and moved it to its new location. When I powered the machine up again, I was no longer able to SSH back in. So I reversed the moving procedure, hooking up a monitor and mouse, and all was working again. Frustrating! It turns out that this model of Mac mini (Late 2006) does not boot into its BIOS emulation mode (Boot Camp) without a monitor being attached. Upon searching the Web I found conflicting information about how to solve the problem. Distilling the commonalties of the found suggestions, I determined a simple solution. 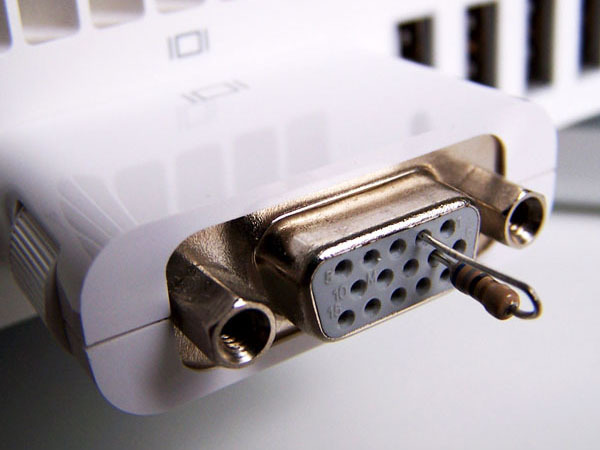 A single resistor, placed between pins 2 and 7 of a VGA adaptor, allowed the computer to boot. The adaptor is the one that came with the Mac mini. The resistor is banded blue-grey-black-gold for 69Ω ± 5% (measured to be 66.7Ω). A photo of the setup is shown below. If you've got any questions, don't hesitate to ask.